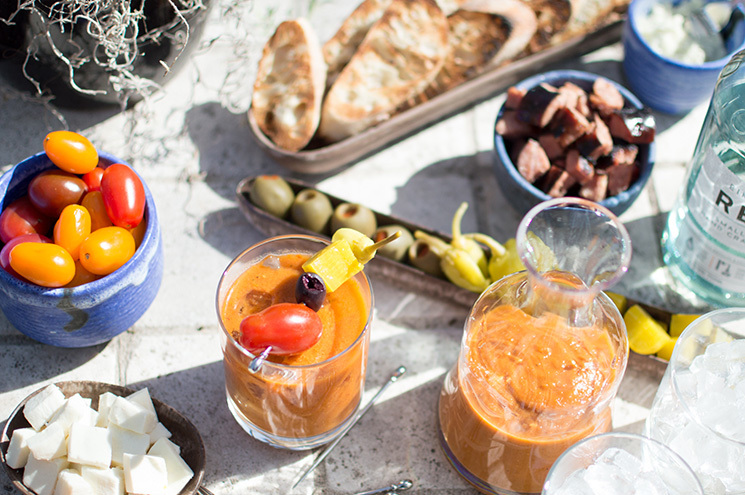 Grilled Bloody Marys? Are you bloody kidding? No, no, I’m bloody well not. When the weather starts to warm up and it’s brighter outside than it’s been in months, I get the itch. Everybody has their own version of the itch. Some folks get excited to start fishing again. For others, it’s running. For me, it’s grilling. Everything. If it needs to be cooked, I want to be outside doing it. 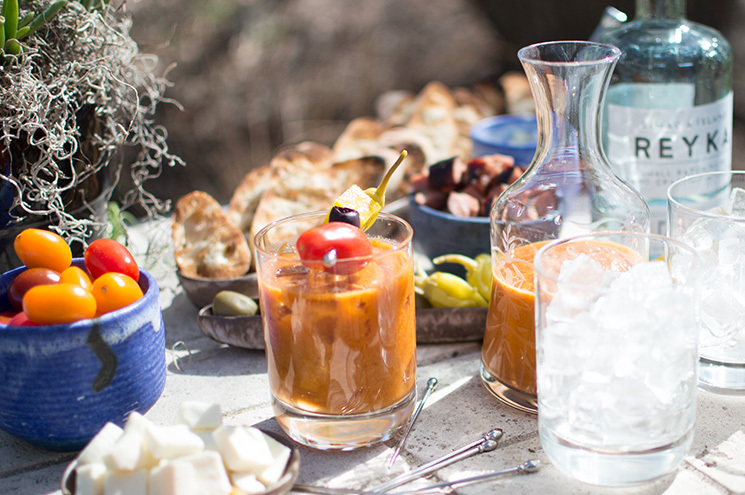 So obviously, spring brunches and bloodies go hand in hand — why not put them on the grill? Get that grill hot and clean. Then put your tomatoes in something metal that you don’t care too much about. I have a bunch of semi-disposable pie pans leftover from a friend’s bakery closing, so I put those to good use. You could use disposable aluminum casserole pans too. 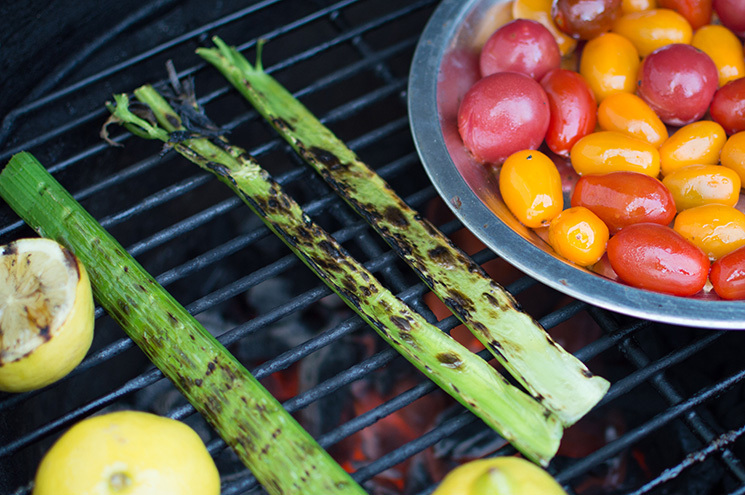 Grill the tomatoes, celery and lemons (cut side down) until nicely charred. The tomatoes will take the longest. You want them to burst and the liquid needs to reduce a bit too. You can help the bursting along with a paring knife (once they’re hot and soft) if you’d like. 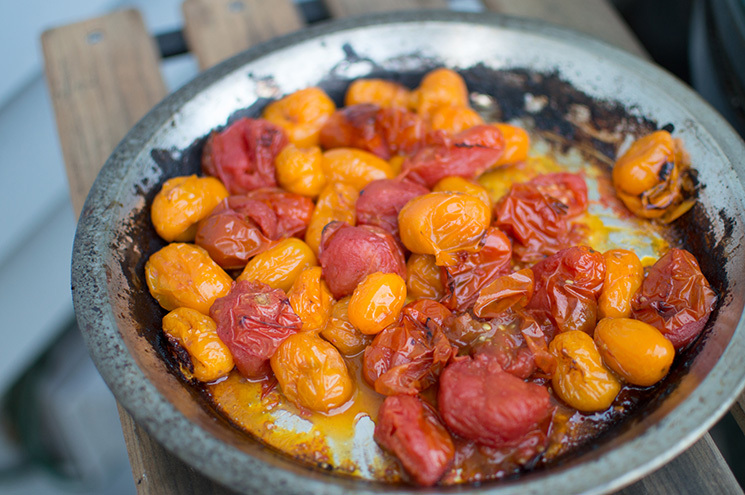 Once the tomatoes look like this, carefully pull them off the grill and pour into a blender. Add celery. Squeeze the lemons into the blender, then add the remaining ingredients and blend until smooth. Combine with cold vodka in whatever proportion you deem acceptable, stir and pour over ice. 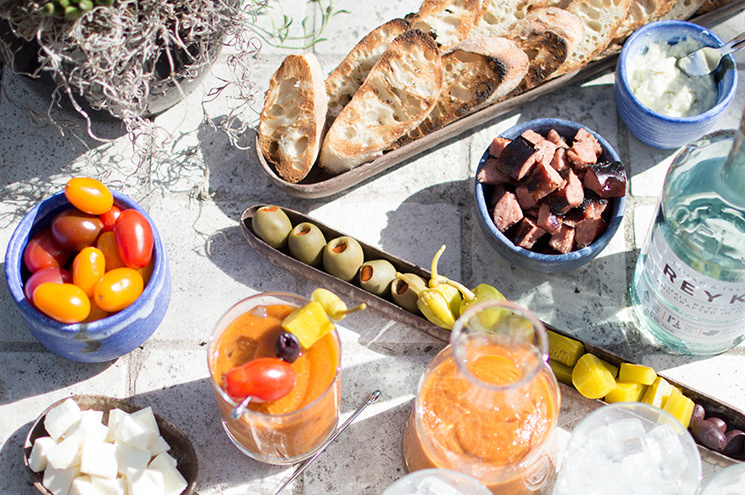 For the salad skewer garnish, I like grilled sausages (though shrimp is fun, too), olives, pickles, pepperoncini, cherry tomatoes, and cubes of mozzarella and cheddar. But whatever you decide to put on your skewer, just remember to have a bloody good time! 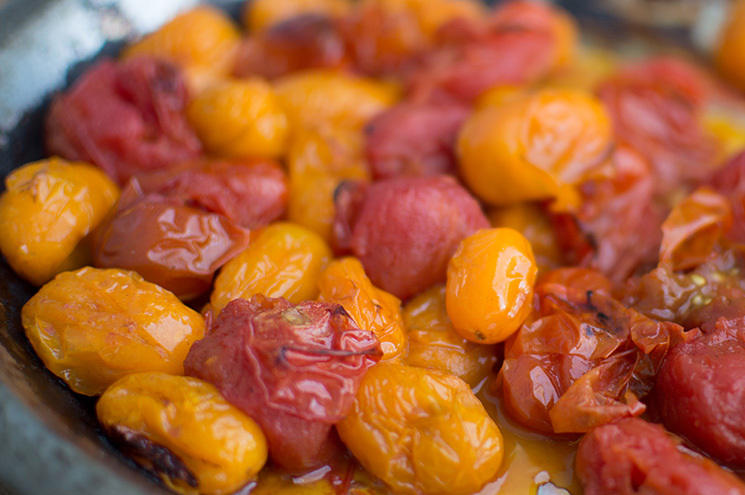 As an avid griller, I am officially adding these to my summer bucket list. Scrumptious idea and gorgeous pics!